When Peter Chanel was born on 12 July 1803, the church in Cuet had been deconsecrated, having been ransacked during the Revolution. So Peter was baptised in the village of Cras four days after his birth. The parish of Cuet was re-established only in 1847, so Peter Chanel’s parish as a child was Montrevel or Cras. His parents were Claude François Chanel, a farmer and miller; and Marie-Anne, née Sibellas, and he was the fifth of their eight children. 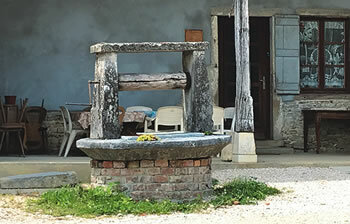 La Potière is the homestead in which St Peter Chanel was born, near the village of Cuet. All that remains from his time is the well in front of the house. 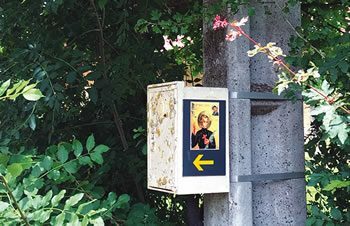 Its presence is indicated by a picture on a power pole. Peter’s father and uncle worked on the farm at La Potière. The household was made up of Peter’s parents, seven brothers and sisters, his uncle and aunt and their two children, and one of Peter’s grandfathers, who had bought the farm in 1895, during the revolution. They lived in the three rooms of the house until 1810. One of Peter’s tasks was to take care of his father’s cows, and during the winter he went to the school at Saint-Didier, five kilometres away. In 1814, at the age of 11, Peter went to school in Cras, living with an uncle and aunt; then he boarded with Fr Jean-Marie Trompier, who had discerned in Peter the beginnings of a vocation. He made his first Communion in Cras on 23 March 1817. Years later he told Br Marie-Nizier, his companion on the island of Futuna, that it was at this time that he decided to become a missionary. In January 1817, Peter felt discouraged and made a decision to return home. 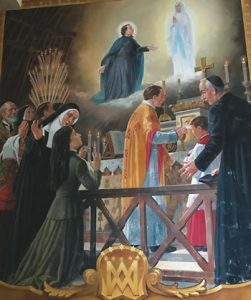 On his way he met the school mistress, who asked, “Have you at least prayed to the Virgin Mary?” He turned around, prayed beneath the statue of Mary and the child Jesus in the church, and changed his mind about heading home. 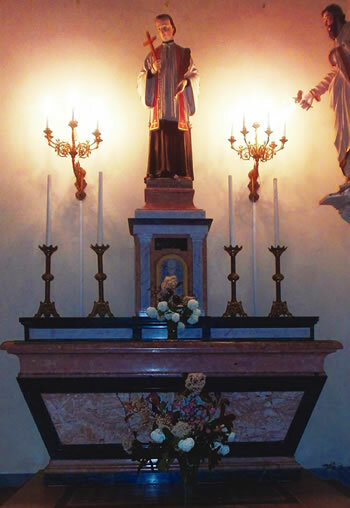 The statue is still in the church in Cras-sur-Reyssouze and is known as ‘Our Lady of Perseverance’. Having received a solid grounding in reading, writing and knowledge of his faith from Fr Trompier, Peter left Cras in October 1819 for the minor seminary in Meximieux. From there, he went to the major seminary in Brou and was ordained a priest on 15 July 1827. Two days later he celebrated his first Mass on an altar which is still in the church in Cuet. 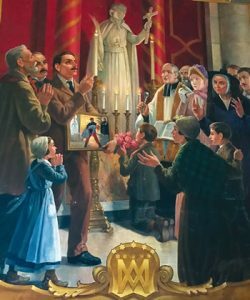 St Peter Chanel was beatified by Pope Leo XIII on 17 November 1889. 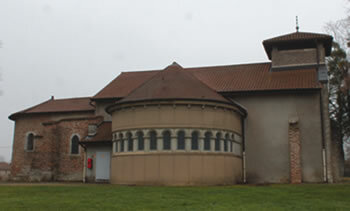 Monseigneur Luçon, the Bishop of Belley at the time, in a pastoral letter of 8 December 1889, decreed that Peter Chanel’s parish would be the official place of pilgrimage and a prayer centre for all the diocese of Belley. 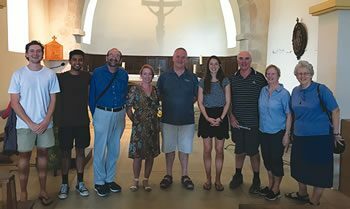 When Peter was canonised in 1954, the church in Cuet, which dates back to the 12th century, was restored and extended, with a chapel on the northern side, in the shape of a rotunda, to accommodate a reliquary containing some of the saint’s remains which had been brought from Futuna. 'Through the intercession of St Peter Aloysius Chanel, Rosalia Monnier was instantly and perfectly cured from pulmonary tuberculosis and from a serious gastric ulcer'. 'Through the intercession of St Peter Aloysius Chanel, Francis Vion-Dury (received) instant and perfect healing from blindness caused by detached retinas'. Stained glass windows in the church show scenes from the saint’s life, and there are two paintings in the nave depicting the miraculous cures that supported Peter’s canonisation. The captions beneath the photos of the paintings on the next page are translations of the Latin texts which are part of the paintings. L1visible, a Belley-Ars Diocese publication, describes the shrine at Cuet as “a humble and hidden place. It is in the likeness of the human and Christian roots of the life and vocation of Peter Chanel, the source of which is in this place. Paradoxically, this very simple place has a universal missionary vocation by reason of its role as a diocesan shrine”. And, in the opinion of this writer, it’s a truly Marist place.